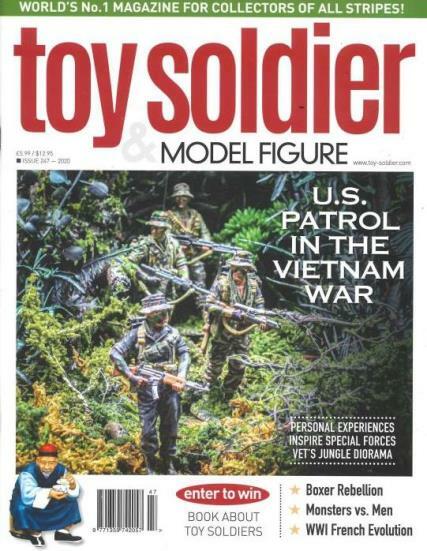 Toy Soldier Collection Magazine is for the serious toy soldier collector. The hobby as a child turns into a collection for young and old alike. Who doesn’t remember their first set of toy soldiers? Imagination and fun join while practicing strategy and planning. This magazine is the one for the serious and the beginner. Interviews with collectors are included in every issue. The magazine is bursting with full-colour pictures of the toy soldiers in each article. Discover how the soldiers are made with specifics on casting and painting from cast masters. Discover where the next toy soldier shows and displays are held. Who knows? There might be one near where you live or work. Visit displays of toy soldiers from around the world. See samples of the various styles of soldiers. From basic army to exotic, see actual pictures of the collections. Get display guidelines, painting tips, and more. Read about new products and old life-like collections. Learn about new soldier releases. Find out who is selling their collection and who wants to buy. Want to add to your collection? Or maybe, you want to start a new collection. Not only will you be able to decide on where to purchase your toy soldiers, but look over other’s purchases too. You’ll drool over the detailed displays pictured in the magazine.